I came across the above photo on Facebook a couple of days ago and it got me thinking about the way we do certain things. As a basketball and a strength & conditioning coach, I witness this almost on a daily basis. Whether I’m at the gym or on a basketball court, I observe people doing things in a manner that doesn’t make a lot of sense, but yet they continue to do it anyway. For the most part, the reason they’re doing it is because their coaches did it, so it’s all they know and hence they continue to repeat the cycle. Others do it because everyone else is doing it and they assume there must be a good reason behind it. A few months ago, I came across an excerpt about an experiment conducted years ago. In the experiment, 5 monkeys were placed in a cage. In the middle of the cage, there was a ladder and on top of the ladder was a bunch of bananas. Every time a monkey went up the ladder, the scientists immediately sprayed the rest of the monkeys with ice cold water. After a while, any time a monkey tried to go up the ladder, the rest of the monkeys beat up the monkey that tried to go up the ladder. After some time, regardless of the temptation, no monkeys dared to go up the ladder. The scientists then substituted one of the monkeys. The first thing the new monkey did was try to go up the ladder, but was immediately beaten up by the rest of the monkeys. Several beatings later, the new monkey learned not to go up the ladder, despite not knowing why. A second monkey was then substituted and the exact same sequence happened. The first monkey even participated in the beatings. Then, a third monkey was substituted and the same thing happened, then to the fourth and the fifth monkey. What was left was a group of five monkeys that never received an ice cold shower, but still continued to beat up any monkey that attempted to climb the ladder. This happens in almost all walks of life, whether it is in school, sports, work or businesses. People do things because it is the way it has always been done. However, I want to challenge this conventional manner of thinking. 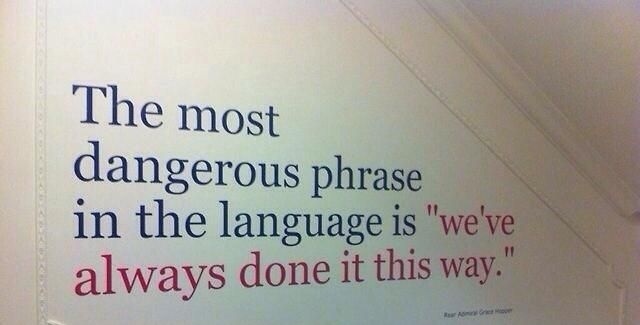 Just because things have always been done one way, doesn’t mean that it is the right way or the most effective way. Why does every team in basketball almost exclusively warm-up the exact same way, despite the fact that they have different playing styles and identities? Why does every team continue to do two line lay-ups? Why do we continue to do 3 man weaves and 5 man weaves? Why do we continue to teach skills through organised drills? Why do we rush to ice any sprains, knocks or minor injuries straight away? Why do we not include strength training components in our youth practices? If you actually get something from doing two line lay-ups, then continue to do so. I will expand and address some of the things that I mentioned above in my upcoming blogs…. starting with the next one which addresses warm-ups and what we can do to make them more effective. Next Post What’s the Importance of a Warm-Up?